I loathe PBIS even more than I loathe Accelerated Reader, and friends, that’s a high bar. To be fair, it’s not just PBIS. It’s all of the same type of behavior management systems that use often elaborate systems to punish and reward behavior in the hopes that students will behave in a way desired by schools and teachers. All of these systems are based on the ideas of B.F. Skinner who is credited with the idea of radical behaviorism. Skinner (who died in 1990 and so can’t defend himself) thought and taught that the only thing that really changed behavior was consequence: if something good happened after you did something, you’d do it more. If something bad happened, you’d do it less. You may have heard this called the “carrot and stick” approach: reward behavior you want to see more of, and punish behavior you want to see less of. Sounds great. Except how it’s not. Here are six reasons I think PBIS is a terrible idea, and what I say about PBIS applies to all similar programs. I’m an equal opportunity hater. I could come up with way more than six, but this is a core sample. Let’s just get this one out there first. It actually doesn’t work. I’ve written about Dan Pink’s book Drive and Alfie Kohn’s Punished by Rewards that explore the many, many problems with this kind of motivational theory. The bottom line: it doesn’t work. It expects the unreasonable. It’s unreasonable to think that if adults simply handled the situations better, the kids would be perfect angels. Friends, this is simply not true. Not all behavior is a result of adult interaction or lack thereof. Skinner was criticized for basing his ideas on animals, and I’ve even seen a pretty well-known book about PBIS that compares this dynamic to dogs and how we shouldn’t blame dogs for their behavior, and instead we should blame the owners. I’m going to state the obvious: kids aren’t dogs. Kids are complex humans with much more cognitive ability than canines. If I don’t care about your punishment or I don’t value your reward, what do you have? That would be nothing. My son’s 1st grade teacher had a PBIS system of colored bears that still makes me see red when I think about it. The damage that system did to him (and me) was lasting. He rejected her system, and we battled it all year. If one teacher doesn’t do it, the whole system falls apart because it depends upon conformity. The PBIS website, which I refuse to link to, even says you shouldn’t do it if 80% of the staff doesn’t buy in. I’ve rarely seen a school where anyone actually asked teachers before they decided to do something like this, so I don’t know how you’d know you had buy in, but whatever. Under these systems, the students who behave well would probably have behaved well anyway, and the worst behaved students often end up with the most rewards. 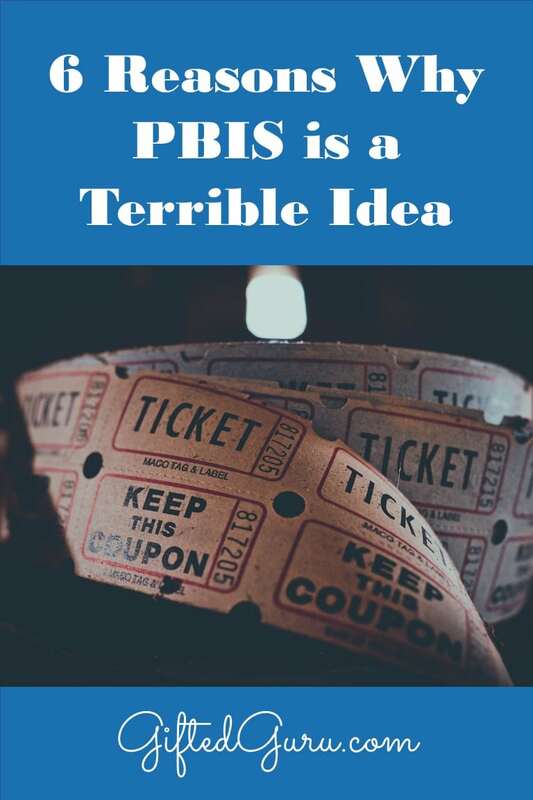 It will probably not surprise you to learn that PBIS was invented by the federal government and the PBIS website is run by none other than the Department of Education. Your tax dollars at work. I should probably stop right here because that should tell you pretty much everything to need to know. Skinner completely rejected the idea of free will. He believed that we only behaved the way we did because of the reinforcement we received. To me, acting as though students cannot be trusted to learn how behaving in certain ways makes it more pleasant to be at school is completely disrespectful to them. It sends this message: You cannot be trusted to make good decisions and must be rewarded or punished over and over again. You will never “graduate” from this program. You’re lucky you have us here to reward and punish you, or we’d all descend into Lord of the Flies. You are my puppet, and you dance to the pull of your strings. #3: It punishes good kids. Our reticular activating systems are programmed to notice differences and discrepancies. Because of this, the idea that we’re going to “catch kids being good” means that teachers are far more likely to notice desired behavior in kids who usually don’t behave well than they are to notice it in the normally well-behaved. This means that the “good” kids are far less likely to earn the rewards than “bad” kids who reform misbehavior, even temporarily. I’ve personally witnessed kids deliberately setting up situations to get “caught” being good. It’s not about behaving well; it’s about the reward. They’re not learning how to live in a community. They’re learning how to manipulate a system to get a reward. That’s no system. Well it is, but it’s terrible. Also, many gifted students reject the hypocrisy and inherent unfairness and may actually begin behaving less well than they otherwise would have in rebellion. #4: It makes it harder on those who come after. This may come as a shock to students at PBIS schools, but when I walk around in my daily life, no one offers me reward recess for doing the right thing. If a student gets used to being rewarded for every little thing and not having consequences for misbehavior, their view of the world will be very, very skewed. I actually think there is a connection between this idea and tip jars popping up in places like fast food restaurants where people seem to expect to be rewarded for simply doing their jobs. If you reward something, you’d better plan to keep rewarding it because these reward systems are like potato chips: you can’t stop with just one. #5: It puts teachers at the mercy of student behavior. In many schools where PBIS is implemented, there are restrictions on how misbehavior is handled. The idea is that you try to ignore it and reward positive behavior. Because of this, teachers are often not allowed to send a student to the office until certain conditions are reached (e.g., parents are called multiple times, you’ve tried positive reinforcement, etc.). That unecessarily hampers the ability of the teacher to intervene in often very serious situations and makes classrooms less safe. Additionally, we shouldn’t need to praise kids for behaving in ways they already knew they should behave. That is false and hollow praise. One example of good implementation on the PBIS website is that if a student isn’t using lab equipment correctly who already knew how, you stop, remind them how to use it correctly, and then praise them for using it correctly. I think you can tell how I feel about that. #6: It’s coercive and manipulative. Theoretically, the other students are supposed to A) care about what the teacher likes, and B) want to be like Aisha. The reality is that they now hate Aisha, and she is very likely to end up getting razzed by other students if this kind of thing happens often. Bullying is not off of the table, either. Also, the other kids who were also sitting appropriately but who didn’t get singled out for this manipulative false praise are thinking, “Why didn’t he say anything about how I am sitting? I’m sitting nicely.” And next time, they just might not even care how they’re sitting because they know they won’t be noticed anyway. Inherent in the praise of one student is the silent criticism of another. This sets up an unhealthy competitive environment that pits student against student. And yet, this is exactly what this dynamic is. It’s not healthy in homes, and it’s not healthy in schools. I didn’t even mention how fake it can feel, how often kids don’t even care about the rewards, how much time it wastes, and how it often results in group punishment/reward. None of these are easy, and none of them is a panacea. I know that it is likely that some with disagree with me, and I would invite those of you who do disagree to actually read some of the real research done on the danger of rewards and true motivational theory. In the meantime, you get five minutes of reward recess for finishing the article. Note: Sometimes I use affiliate links, which means that if you click through and buy something, I get a few pennies (to buy books!). It will never cost you anything extra.